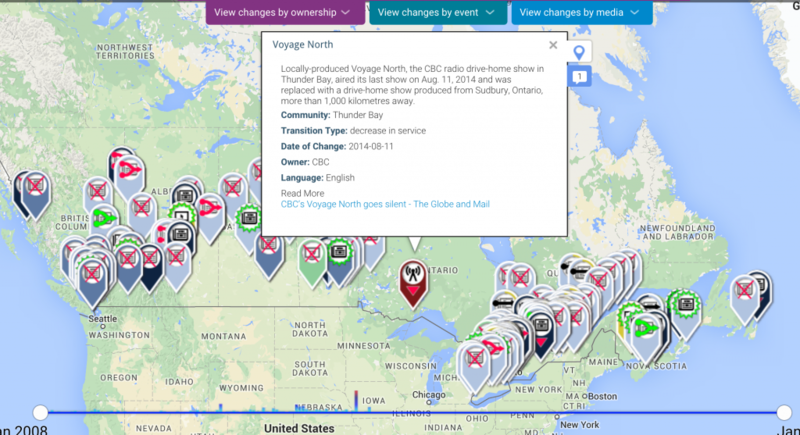 Once the map is open for business, members of the public will be able to add information about changes to the local news landscape in their community. Lindgren says outreach for the crowd-sourced map will be done in phases to encourage regular contributions of new information over time. News about the map’s availability will be shared, for instance, with the community associated with the Geothink research project, which provided funding for the map’s creation. Organizations serving journalists and news media, media workers’ unions, and communications and journalism scholars will also be encouraged to contribute. “I’m hoping that we can also get the news media interested in the map so the general public will find out about it and add information to it,” Lindgren said, noting that the crowd-sourced data will be vetted to ensure the map’s accuracy. 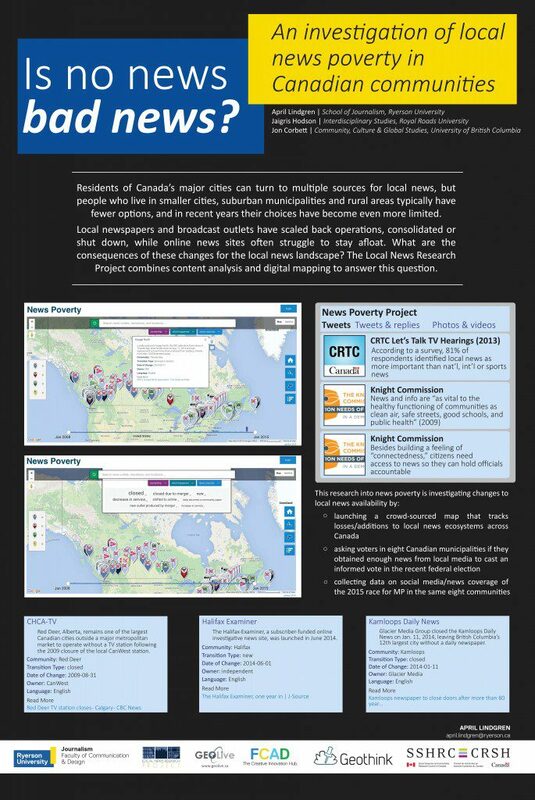 The map will also include a link to a survey that asks citizens about the availability of local news in their communities and whether their information needs are being met. In its initial phase, the project will also examine the role of local news coverage and social media in the 2015 federal election. “We want to see how much news coverage there was of local contests for MP – what could people find out from their local news media and did they get enough information to make an informed decision,” said Lindgren, who will supervise the content analysis of news produced by traditional news sites in eight Canadian communities. Data on local reporting on the election was gathered by scraping all local news media websites in each community. “To the extent that local coverage of the election reflects the vibrancy and viability of local news media, it may well be a proxy for local coverage in general and an indicator of different levels of local news poverty in different communities,” Lindgren said. Hodson, meanwhile, is the principle investigator for Election News, local information and community discourse: Is Twitter the new public sphere? a SSHRC-funded project that will investigate the role of social media in disseminating news and information about the local races in the same eight cities, towns and rural municipalities. Hodson will investigate the extent to which Twitter and Facebook were used to share news and information about the local races in the eight communities. They include Brandon, Manitoba, the British Columbia cities of Kamloops and Nanaimo, and the Ontario municipalities of Brampton, Oakville, Thunder Bay, City of Kawartha Lakes and Peterborough. Lindgren, who is co-investigator on the SSHRC project, said the communities were selected based on their location, whether they were suburban or rural, and their proximity to a major media market. The list also includes municipalities that have experienced a major disruption in local news sources (such as the closure of a daily newspaper or television station) and others where the media landscape has been relatively undisturbed. Survey: Did voters get the news they needed to cast an informed vote? The outcomes of the website and social media content analyses will be examined in conjunction with the results of a survey conducted during the 2015 campaign. The survey asked voters questions about where they went for news about the local contest for MP, whether they used social media to comment on or share local election news, and whether their local media gave them enough information to cast informed votes in the 2015 federal election. “Among other things, we’re hoping this survey data will help us investigate whether there is any correlation between the amount of coverage of the local races for Parliament and voter participation,” Lindgren said.